While I was initially a little underwhelmed by what the last road map had to say about changes to Conquest, Eric Musco had some details to add this week which piqued my interest. Yes, the UI will be reworked, but there will be more to it. 1) The planetary leaderboards will become meaningless except for the number one spot, which will still earn you the corresponding achievement and title. Beyond that though, guilds won't really compete against each other for the rewards anymore; instead they will just have a "guild target" to beat in order to earn rewards, in the same way the personal target works. This mostly sounds good to me, though I'm also a little sad to see the competitive aspect go away for everything but the top spot. I remember some fun times fighting against other guilds for one of those coveted top ten positions. On the other hand, it kinda sucked if you were suddenly pushed down into 11th place shortly before reset (and it's not like you could see it coming, since the score of the guild in 11th place wasn't displayed). 2) No more invasion bonuses. Previously, the invasion bonus was the main reason that some planets were much more highly contested than others - those that gave multipliers to several popular activities were obviously more desirable destinations than a place that only boosted your points earned from GSF for example. However, all planets will not become equal: Some will offer higher "guild targets" as described above, with better rewards, and some will have lower targets with smaller rewards. Apparently the idea behind this is to encourage bigger guilds to compete with other big guilds and smaller guilds against other small ones. I have kind of mixed feelings about this. I think that in combination with the new guild target system, it's a good thing that there will be different things to strive for for guilds of different sizes. However, I don't think it will make any difference in terms of competitiveness... after all, Bioware is removing all competition from the overall leaderboard anyway, which only leaves the top spot to fight for, and I see no reason for that to not still go to a large guild most of the time. After all, if you're going for the title, you're probably not that fussed about the size of your weekly reward anyway. 3) Conquests also won't be on a schedule anymore (except for those that are tied to specific world events). Instead the events will be randomised so that people can't stock up and pre-craft for certain weeks by the thousands anymore. I sort of get the logic behind that, but on the other hand being able to prepare for Total Galactic War for example was one of those things that could make a real difference to a small guild. I guess we'll see how this one shakes out in practice. 4) Finally, your personal conquest multiplier won't be tied to how full your strongholds are anymore. Thank god! To be honest the connection between those two systems has always been awkward and forced... though Bioware isn't getting rid of it entirely; instead the bonus will be based on having a certain number of strongholds fully unlocked. Still, at least that's a lot less annoying. Even Eric himself joked about how now people won't have a reason to fill their strongholds with chairs anymore. In my guild we were more prone to "poster puke" instead, plastering the walls with those free trophies you get for beating certain bosses in flashpoints and operations. 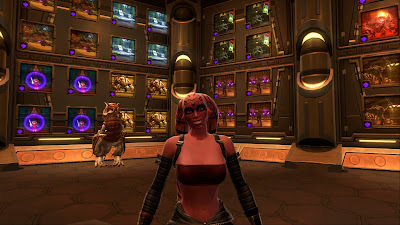 I did it once, on Nar Shaddaa, and then felt vaguely dirty about it, so I didn't repeat the process in my other strongholds and just learned to live without a full bonus. Going forward my scores will be fully boosted anyway, woohoo! The conquest UI showing an internal guild leaderboard. You could already look up this information in the regular guild window if you wanted, but I guess having it more prominently displayed will put those people working hard on the guild's score more into the spotlight and maybe encourage others to chip in as well. Seems nice. Conquest objectives will now also reward things like XP and credits. That one seems kind of redundant to me because most of them are activities that were already rewarding those things anyway. It just seems like a little overkill? Not that I really mind though. Objective points have been rebalanced, and in addition to one-time and repeatable, there will also be daily objectives now. The latter change sounds really good to me, because that was something that I always thought was missing from the system. Either way, it remains to be seen how these changes will ultimately play out. To be honest I'm a bit worried that they'll get me interested for two or three weeks and then my interest will drop off again because working on Conquest on top of my other everyday goals is too much effort for too little reward. Then again, if it was so easy that you could do it automatically, what would be the point? I'm curious to see how it will change the feel of Conquest in any case. As far as i can read some of the feedback on the new system, EA/BW fucked it up again?! Personally i'm not that much into conquest, but my guildmates on teamspeak yesterday...well...there is this expression "to rant and rave". I didn't have much time to play around with it yet, but didn't hear anything bad either, just people laughing about the bug that makes killing a random mob count as a world boss. Looking at the forums, it looks like there were some more unannounced changes, some of which are currently a bit unbalanced, but I can't say that's a huge surprise. I expect some fine-tuning will still be required.